Construction began on the original Tacoma Narrows Bridge in November 1938. On July 1, 1940, the bridge opened to traffic. Lauded as an essential economic and military portal to the Olympic peninsula, its completion was called a triumph of man's ingenuity and perseverance. It had been completed in record time and, with a 2,800-foot central span, was the third largest span in the world. Immediately upon its opening it began swaying in the wind, which earned it the nickname "Galloping Gertie." Only four months later, the bridge collapsed on November 7, 1940, in winds of 42 mph (67 km/h), this collapse was deemed “the Pearl Harbor of engineering." Contemporary accounts appeared to be shocked by the collapse, although the bridge had begun exhibiting wavelike motions during the final stages of construction. Professor F.B. Farquharson, an engineering professor at the University of Washington, and other University engineers were hired to suggest methods to reduce the movement on the bridge. Over the next few months experiments were conducted on a scale model, but a solution to the problem proved elusive. 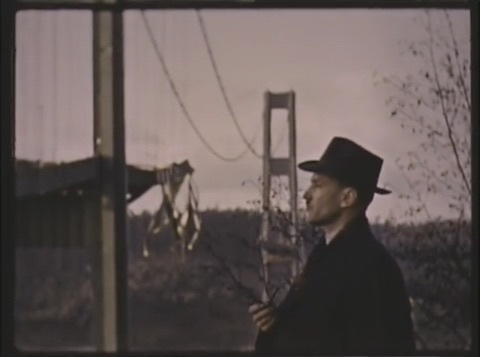 On November 7, 1940, Professor Farquharson was there to witness and document the spectacular collapse of what had been the third longest suspension bridge in the world with the longest single span in the country. Farquharson claimed that the bridge "had a lateral twisting motion, in addition to the vertical wave," which the bridge hadn't exhibited before. The first span of the bridge to give way did so around 11:02 AM. This began with a 600-foot section towards the West side of the bridge, following this another span dropped. By 11:10 AM the bridge had settled with 30 foot deep sag to it. The only fatality was a family dog, Tubby, who was too afraid to exit the car in which he was seated. Farquharson wasn't the only man on the bridge with a movie camera that day. Barney Elliot and Harbine Monroe, from The Camera Shop in Tacoma, and Walter Miles, a supervisor with the Pacific Bridge Company were stationed with him on the east side of the bridge. Dr. Jesse Read was on the west side of the bridge, however, his footage has disappeared. In the aftermath, many theories were discussed concerning the cause of the bridge's collapse. Ultimately an investigative board for the Washington State Toll Bridge Authority announced the failure was due to the bridge's design reacting to the wind in the Narrows. Although rebuilding the bridge was immediately suggested, investigations on the wreckage found the entire superstructure to be unusable. The onset of World War II further stalled attempts to rebuild. Salvage activity continued on the bridge through 1942 with the materials going to the U.S. war effort and the profits saved for the construction of a new bridge. 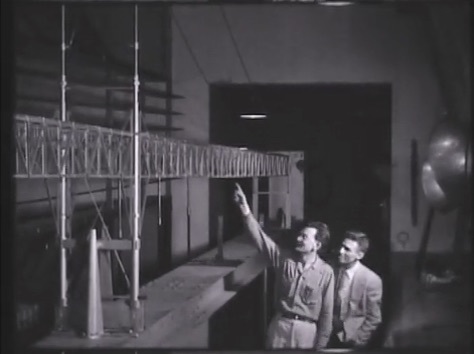 While the salvage work went on, Professor Farquharson was commissioned to test models of the old Narrows Bridge and the new proposed design for the bridge. At the University of Washington's new structural research lab, built specifically to house the models, tests proved that the new design was sound. Construction on the new bridge began in the summer of 1948 and was finished in October 1950. The previous three and a half years spent studying aerodynamics ensured a bridge whose fate would not mimic the first. The Tacoma Narrows Bridge has remained standing. This digital collection was researched and prepared by the UW Libraries Special Collections Division in 2017 with a a generous grant awarded by the Friends of the Libraries (University of Washington Libraries). The clips in this collection were selected from the Tacoma Narrows Bridge Film Collection (PhColl 950) residing at the UW Libraries Special Collections Division. Selection of films was done by Hannah Palin and the research and descriptive data was prepared by Alexis French and Maisie Harrison. Films were imported into Final Cut Pro using an Elmo TRVG16 and files were created using Quicktime, transcoded to H264 mp4, and linked with descriptive metadata.